Here's an example of how one of our grade 6 Math/Science teachers made the assessment criteria transparent and visible to students. The assignment was to identify a leaf using a dichotomous key and then create a summary of the student's observations. Working together, the teacher and students created the descriptors for the four marks (1-4). Students then taped their own summaries to the board, self-assessing their work based on the criteria they developed as a class.. At the end, students were given the opportunity to reflect on the mark they gave themselves, and were able to change and improve their assignment. 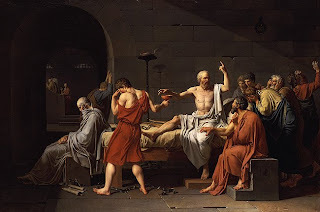 After an off-hand statement with one of our APs over lunch, I found myself teaching a course on the history of Western philosophy for the first time. As no one in the school had taught this before, I was thrust into a course with little preparation or ability to draw on others more experienced than I to gain some insight into how to best organize this course. However, through Neil Stephenson and a twitter connection he had, I was able to Skype with Brad Ovenell-Carter, teacher on Bowen Island who had taught a course on Philosophy for over fifteen years. Resulting from this conversation our classes will now be conversing through a Ning (a form of collaborative website) where we will dialogue and share reflections on enduring issues in philosophy. Additionally, Brad directed me to several resources related to a Renaissance unit our grade 8 students will be doing later in the year. In terms of how this is shaping my professional development, the ability to connect with teachers a thousand miles away through SKYPE changes the whole model by which we often do PD. In my previous experience, PD entails choosing from a range of workshops that may or may not be relevant to what you are teaching. In contrast this model allows me to collaborate with someone doing a similar course which as a result has both offered insight into how to organize the class as well as opens up possibilities for our students to cross-collaborate and dialogue. In my conversation with Brad, he discussed how tweeting is becoming his main source of Professional Development since he now has networks right across North America. I am starting to see how new technologies have the ability to open up a transformative space for education, and that teachers will no longer rely on school or district boundaries to initiate new approaches to education. Our two grade 7 science teachers are starting a research project for the "Plants for Food and Fibre" unit of the grade 7 program of studies. 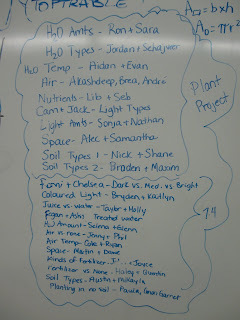 The plan for the project is to have students examine a number of variables to determine which plant need has the greatest impact on plant growth. In pairs, students have selected a variable to examine, and over the next month, will begin to design ways test the impact variable on plant growth, and to collect and document data along the way. To collect the data, the teachers have decided to set up a wiki (using http://www.wikispaces.com) for each of our four grade 7 classes. On the wiki, each pair of students will create a page for their particular variable. This is the first time these two teachers have used a wiki in class and they're excited because it allows for a number of authentic extensions to the project. 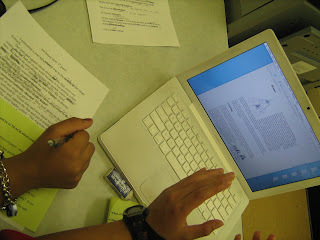 First, using a wiki means that the data collected by each set of students becomes public. This means there's a more authentic audience for the student work, increasing the potential buy-in by the students. Also, at the end of the data collection period, the teachers can now build in a synthesizing task. Right now the teachers are thinking of asking the students, "Which of the different plant needs has the greatest effect on plant growth." While this final question might change, still the power of the wiki is that all the different groups' research now has a meaning and purpose, for all the other students, not just themselves. Each pair of students in now relying on all the other students to accurately produce methods and data to benefit the whole class. While the teachers could have had each group present their data, building a collaborate wiki means that greater analysis of others groups findings can occur. This means that additional conversations and expectations need to be had around the presentation of student data. The teachers are planning to build a rubric with the students around how best display the data. The quality of the communication now matters significantly more because other students need to be able to interpret and understand each groups findings. 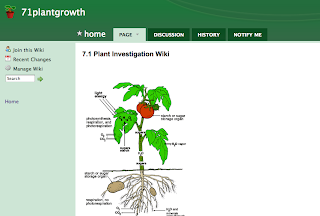 What these wikis create in a knowledge building environment, where the quality of each groups' findings directly impacts the collective experience of the whole class. They're getting started later this week - we'll keep you updated with the process! As always, if you have feedback/suggestions/other ways to take this project, please do comment below. We know we don't have all the answers, and are always looking for ways to improve the work we design for our students..
One of our teachers, Neil Stephenson, is offering a session at the upcoming Alberta Social Studies Conference, October 16-18, on a year-long Humanities project called the Cigar Box Project. 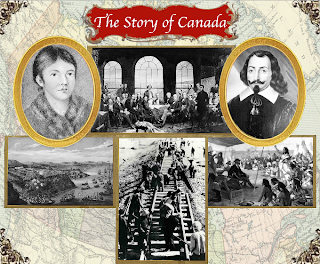 Empowered with 21st century tools, Neil’s Grade 7 students reinterpreted events from five periods that have shaped Canada’s current historical landscape. Over the course of the year, students collected and analyzed historical images and artifacts, and then used graphic design principles to digitally assemble new cigar panels, each one revealing a unique, visual perspective of an historical event or time from Canada’s past. At the end of the year, students physically built their wooden Cigar Boxes, creating their own historical artifact that pulled together the story of our country. Along the way, students encountered a variety of assessment practices, created mini-documentaries about their artifacts and met a number of experts who supported their historical learning. You can read more about the Cigar Box Project at the Galileo site about the project, or on Neil's personal blog, Thinking In Mind. Two our of Grade 5 teachers are giving a presentation at the upcoming Alberta Social Studies Conference, October 16-18 in Lake Louise, Alberta. This presentation will focus on how to incorporate digital storytelling into the classroom, particularly where teachers want students to focus on understanding multiple perspectives and marginalized groups in history. When designing the work (in partnership with the Galileo Educational Network) the teachers used an online space called Intelligence Online, designed specifically for the planning of large-scale, inquiry-based projects. One of the benefits of IO is how it creates 'project pages' or publicly accessible websites that contain an overview of the project, as well as specific tasks, handouts, due dates, resources, and assessments. These project pages are designed to communicate the overview of a project to both students and parents. This year at the Calgary Science School, there's a new structure to the Fine Arts Program, bringing in the element of choice at the grade 7 and 8 level. One of the new courses being offered is an introduction to Graphic Design. The first assignment students are working on is a logo design project. 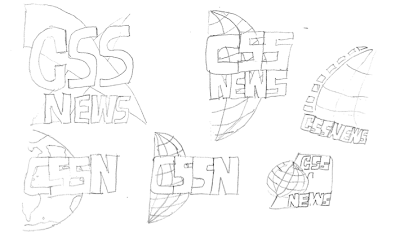 To set up this project, students were introduced to 5 principles for effective logos. Using this great post by Jacob Cass, students were able to examine clear examples for each of the 5 principles, as well as many examples of poorly designed logos. Next, we used the great database of logos at Brands of the World, and students were asked to select and sketch 5 logos that clearly used the 5 principles of effective logos. After that, students were given their first design assignment. 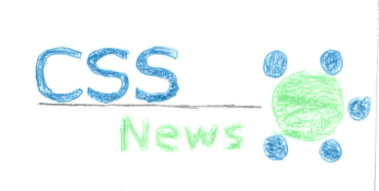 One of the other new grade 8 Fine Arts courses being offered is a Calgary Science School News Channel. 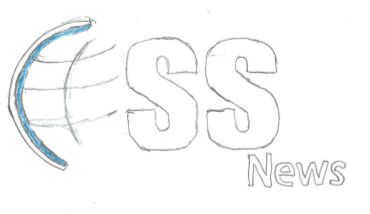 This new CSS News team needs a logo, so this became the first assignment for our graphic design students. Here's some of the students sketches as they work toward their final design. After finalizing our sketches, students will begin the process of digitally building their logos using Adobe Illustrator. 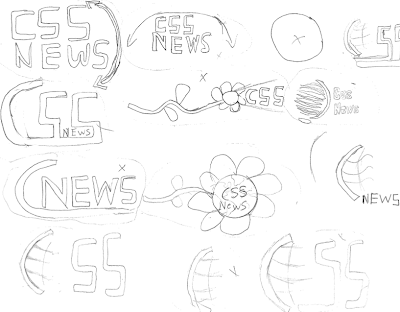 We're thinking about posting some of our final designs on line, to help us choose the logo that gets used by the CSS News Team. What do you think - will you come back and vote on the winner? Last week, our Physical Education team met in order to weave more 'inquiry-based learning' into the way Phys Ed is taught at our school. The team came away excited about the planning session, and is now making two significant changes to the way the Phys Ed program is being presented this year. As a way to build more authenticity into the project, the Phys Ed team is also hoping to get local athletes to provide their own answers to the two questions. They're wanting to collect video podcasts of the athlete's responses to be shared with students. 2) Portfolio Based Assessment. This year our Fine Arts and Phys Ed team are adopting portfolio-based assessment, and moving away from traditional report cards. 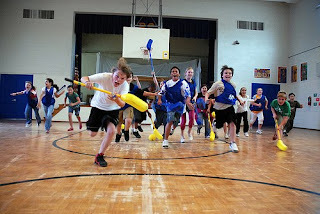 In Phys Ed, the two questions: How did you best develop your skills? and What makes an effective team member? will become the focus for the student portfolio. Here's an example of the year plan from our grade 4-6 Phys Ed teacher, outlining the units covered, the skill development, the attitude stressed and the form of assessment used. Overall, the Phys Ed team is excited about the possibility - although there's some healthy fear and concern about this new direction. We'll be sharing the results as the students begin to collect artifacts of their learning. 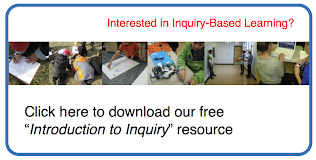 Here at the Calgary Science School we have a mandated focus to build our practice around Inquiry-based Learning. This Grade 8 Project Needs Your Help! Our grade 8 teachers are currently working on a large-scale project that will soon need your help! In Alberta, the grade 8 Social Studies curriculum revolves around "Worldviews." One of the core concepts our teachers want to get across this year is that different groups of people have different worldviews. 1) to build hypotheses about which indicators (age, location, gender, etc) might have the greatest impact on people's worldviews. 5) make it go viral using social networking - hopefully getting some responses from around the world!! We're pretty excited about the idea - even though it seems a little audacious! We think it will be fantastic for our students to track the data as it streams (or maybe trickles!) in. We're also excited about the cross-curricular connections between the Humanities and Math curriculum areas. Since we haven't yet introduced this project, we value your feedback and suggestions. In this episode, a grade 7 Social Studies teacher shares an approach where are students are asked to defend a chosen First Nations group against historical critiques. 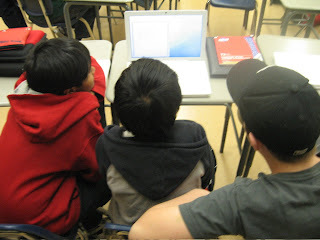 One of the goals of the assignment was to include a problem or challenge for the students to respond to while they were researching Canadian First Nations. As always, we invite feedback and discussion on the materials we publish. Please feel free to comment.